Former Sengoku featherweight champion and Bellator MMA competitor Marlon Sandro has been accused of domestic violence. 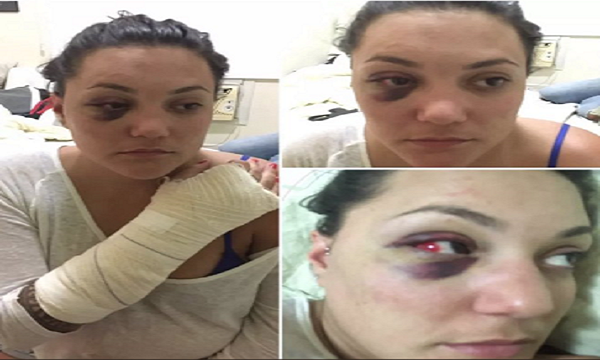 The 40-year old Brazilian allegedly attacked his fiancée, Tayssa Wuensche on Thursday morning in Rio de Janeiro, Brazil. The couple got engaged just last month. In the photo below you can see that Wuesche is in the hospital with an injured arm and bruising to the eye and area around it. The assault allegedly took place around 4 a.m. after the couple returned home from a soccer match between rival teams. It is said to have happened in the Sao Salvador Square in Catete, Rio de Janeiro. According to one of Wuensche’s friends, Sandro grabbed Wuensche while she attempted to enter a taxi, throwing her on the ground and injuring her arm and knee. Sandro then allegendly choked Wuensche out with his hands in the middle of the street and hit her again multiple times after she woke up. Wuensche confirmed her friend’s account of the incident in an interview to Combate. Sandro holds a professional mixed martial arts record of 26-7-2. He was known to train at legendary Brazilian MMA gym Nova União, howeverfounder André Pederneiras, says Sandro is no longer with the team. 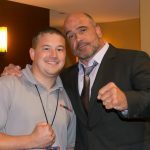 Sandro fought 11 times under the Bellator MMA banner from 2010 to 2014.